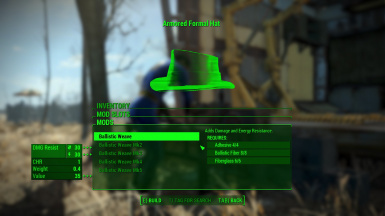 Adds the ballistic weave mod to nearly every article of clothing in The Commonwealth. Confused and frustrated by the seemingly random distribution of the ballistic weave mod? Want to look your best without getting slaughtered? Tired of wearing the newsboy cap? Well then I have the mod for you! Expanded Ballistic Weave aims to add the ballistic weave mod to nearly every article of clothing in The Commonwealth. This mod DOES allow you to add ballistic weave to most of the clothing in the base game and all DLCs. This mod DOES NOT remove the requirement of finishing the Railroad quest in order to gain access to the ballistic weave mod. I recommend No Rail Road Ballistic Weave for that. This mod DOES NOT allow you to add ballistic weave to armor pieces and other non-clothing (i.e. Metal Helmet). This mod DOES NOT allow you to wear armor pieces over any piece of clothing. I recommend Armorsmith Extended for that. Check the readme for a full list of clothing items changed. Drop the .esp files into your Data directory.